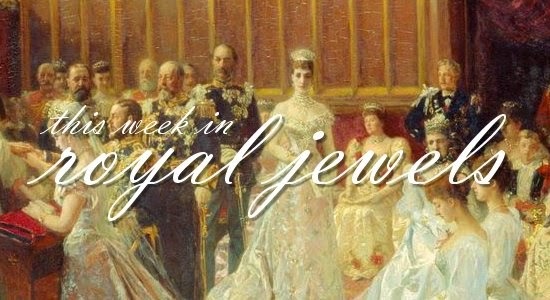 A state visit, a meeting between two monarchs, and a national celebration bring us plenty of sparkle this week. Enjoy! 10. With her work schedule back in full swing, Queen Elizabeth II and the Duke of Edinburgh visited one of her palaces, the Tower of London, to tour the crypt and the Tower Poppies exhibit on Thursday. She wore a piece of heirloom jewelry for the day: a cabochon emerald and diamond brooch that was once part of a stomacher that belonged to the Duchess of Teck. Queen Mary had the brooch created in 1897; it's usually worn with a cabochon emerald drop, also taken from the Teck stomacher. 9. Queen Mathilde of the Belgians is really pushing the envelope where "large earrings" are concerned. This is the floral pair that she wore to a concert at the palace in Brussels on Wednesday! 8. For a visit to the Barbara Sinatra Children's Center on Saturday, Princess Charlene went with slightly smaller earrings: a pair of diamond stud earrings by Cartier. 7. On Sunday, the Spanish royals attended a military parade to mark the country's national day. Queen Letizia wore a pair of colorful drop earrings -- possibly with cabochon gemstones? -- that coordinated with her outfit. 6. Turquoise was the Duchess of Cornwall's gemstone of choice for a day of engagements in Kent on Wednesday. With her usual diamond and pearl earrings, she wore a pair of turquoise, diamond, and gold bird brooches and a turquoise bracelet. 4. On Wednesday, King Felipe and Queen Letizia of Spain paid an official visit to the Netherlands. Letizia's theme of the day was red: red suit, red lips, and a lovely pair of ruby and diamond earrings. 3. Queen Maxima went with an even more dramatic look for the Spanish visit. Her diamond earrings are the studs from Queen Wilhelmina's diamond pendant earrings, created in 1889. Her necklace is a supplemental royal security measure. 1. Queen Sonja of Norway gets my top spot of the week -- not only for her pearl-and-gold jewelry at the welcome ceremony on Monday but also for her jewels at the banquet that evening: the Norwegian emerald parure, plus a pearl bracelet with a diamond and emerald clasp, a gold bangle, King Harald's family order, and the insignia of the Order of St. Olav.